In a medium bowl, combine the egg yolk, mozzarella cheese, ricotta cheese, salt and pepper and mix until everything is well incorporated. Separate the pizza dough into 4 even sections. On a surface dusted with flour, roll each out to be a small circle that is about ¼” thick and place on a baking sheet. 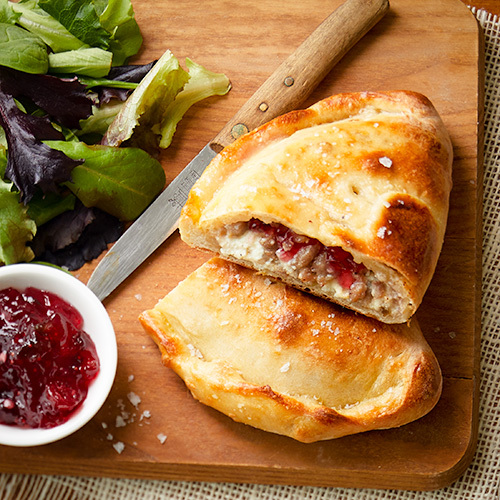 Along the top half of each circle, leaving about a ½ inch empty along the top, spread ¼ of the ricotta cheese mixture, ¼ of the cooked sausage and top with 1 Tablespoon Hot Pepper Cranberry Jam. In a small bowl, whisk together the egg and water to use as your egg wash on the calzones. Brush the edges of the open calzones and fold the empty half over the ricotta and sausage, creating a half moon. Using a fork or your fingers, crimp the edges of the calzone well to ensure they stay closed while cooking. Brush the tops and edges of each calzone with the egg wash mixture. With a sharp knife, slice 3 small slits on the top of each calzone. Bake for 15-18 minutes, or until calzones have browned. Serve hot.